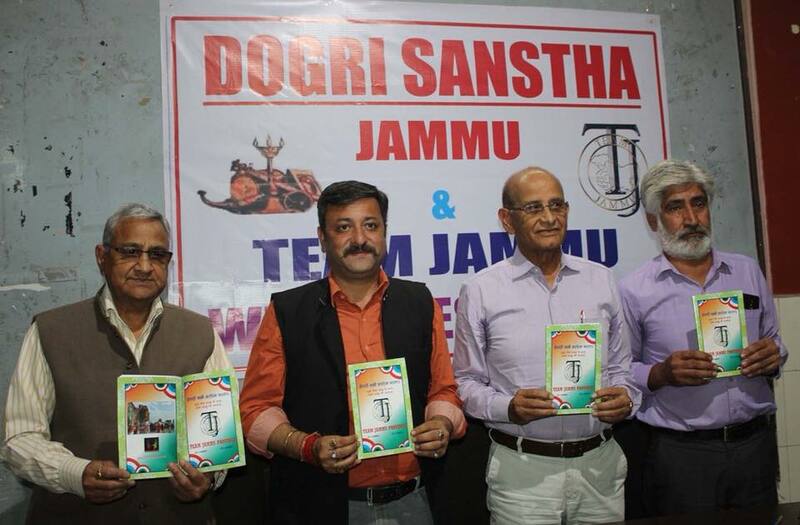 Dogri Sanstha Jammu and Team Jammu jointly released a book of collection of Dogri poetry entitled “Dogri Kanne Matreya Bartaa” (Step motherly treatment with Dogri) in a function marked by the presence of senior Dogri writers and a large number of young volunteers of Team Jammu. All poems contained in the book express the anguish and pain of Dogri poets at the callous attitude of the Government toward Dogri by not giving it a due place in the education system of the state. The book has been published by Team Jammu Province. The poets where poems are in the collection include Chhatrapal, Randhir Singh Raipuria, M.S. 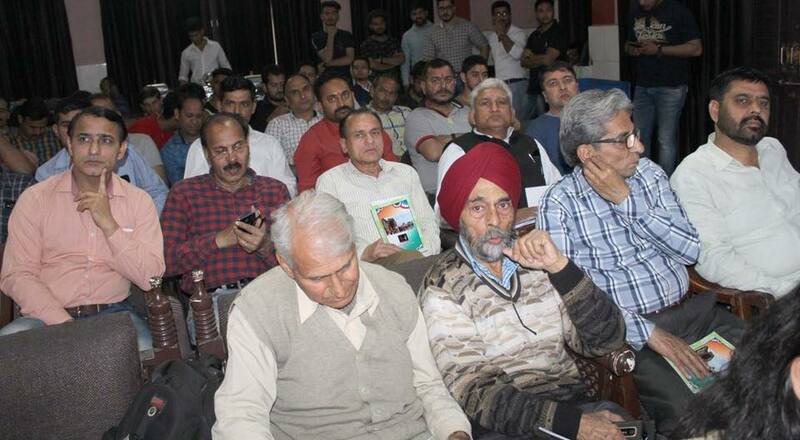 Kamra, Abdul Qadir Kundria, Gianeshwar , Shusheel Begana, ‘Arsh’ Om Dalmotra, Dr. Padam Dev Singh and Vijaya Thakur. The poets recited their poems in the function, which charged the atmosphere with the fervour for love of mother tongue (Dogri) & motherland (Duggar). Prof. Lalit Magotra, President of Dogri Sanstha, who presided over the function, said that lately the attitude of the Government has turned so much anti Dogri and anti Dogra that is smacks of conspiracy to divide the state on linguistic and regional lines. It appears that there are forces in the government machinery who are bent up on crating misunderstanding among the communities he urged government to remain visitant against such elements. 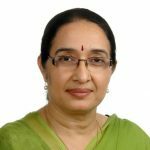 He also stressed that the government should fulfil its obligations towards promotions and developments of Dogri quoting the data, he raised that though an order teach Dogri at primary level in the schools was issued by the government way back in 2006; to introduce Dogri has been taken in negligible numbers of schools. 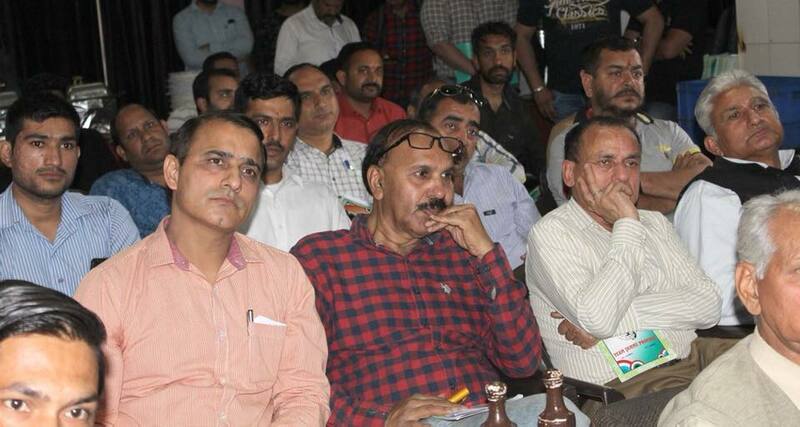 He future said that at least 60 higher secondary in Jammu region need a Dogri teaches to which the present government is ignoring for reasons best known and to them. All this speaks of the callous attitude of the government towards Dogri. 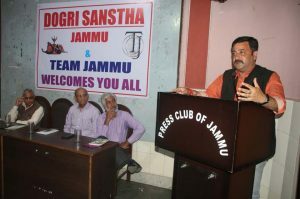 The programme was conducted in a masterly manner by well-known Dogri poet and literary Secretary of Dogri Sanstha Susheel Begana. 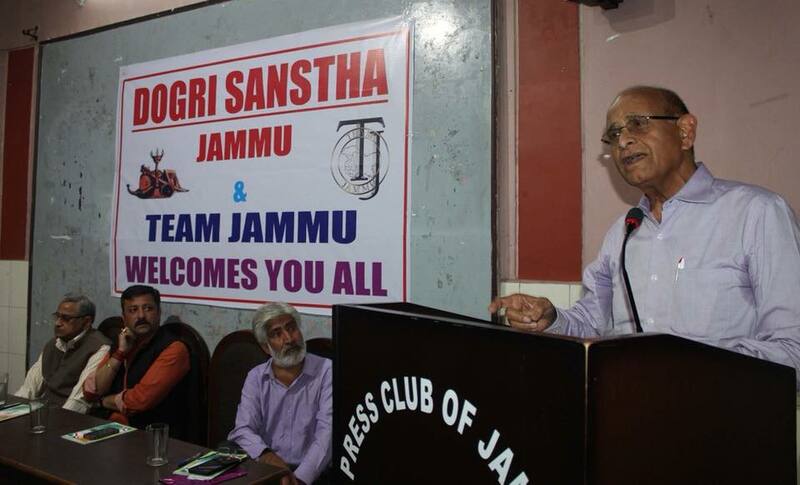 Vote of thanks was presented Dr. Nirmal Vinod, General Secretary of Sanstha and prominent Dogri Poet.